When heading out for bow hunting or target practice, a bow is normally top of the list. 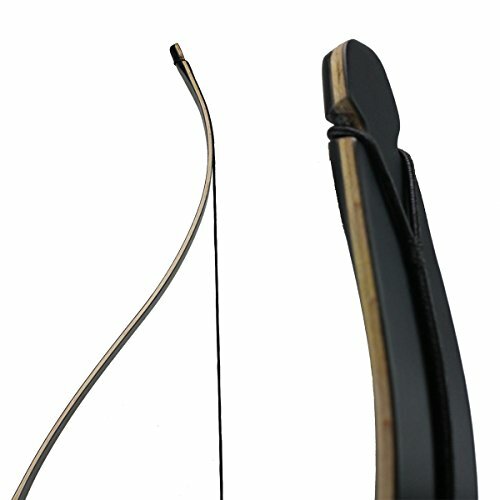 The quality and design of the bow will mean either a comfortable shooting experience or not. With plenty of bows to choose from, what features do you look for? The unit you want is one that’s not only durable but easy to use. For a bow you’ll be using to shoot from repeatedly a comfortable grip is non-negotiable. Luckily for you the Sinoart Recurve bows are designed with these attributes in mind. We’ll review the best Sinoart recurve bows and you can simply choose the one that works for you. Here we have a bow designed specifically for right-hand shooters. This means it’s held in your left hand but the string is pulled using the right. This is a really nice 60 inch recurve bow. This particular option is ideal for beginners for target practice and for hunting too. Keep in mind that the SinoArt Falcon Recurve Bow is only designed for right-handed shooters and cannot be used by lefties. It features a very high-quality metal riser made of strong composite materials. The metal riser, or in other words the handle, has been rounded, which is also true of the limb pockets, making the SinoArt Falcon Recurve Bow easy to hold and quite comfortable too. At the same time, this bow is also designed to be very lightweight and portable for long-term use. If you see fit, you can purchase separate limbs to increase or decrease the weight. 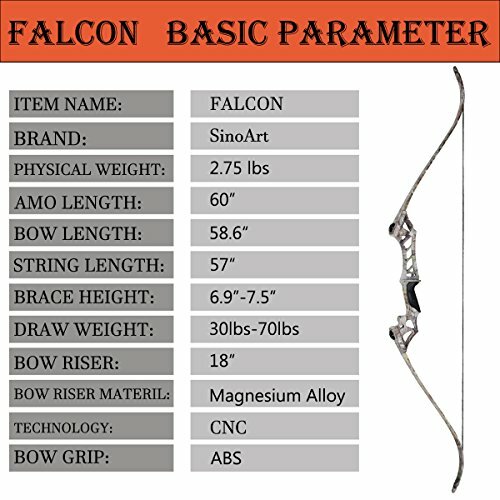 Depending on which limbs you have, with the SinoArt Falcon Recurve Bow you can achieve a draw weight of 70 pounds, which is more than enough for hunting small prey. The surface layer is constructed using high-strength and superior raw materials. The sandwich layer is made of double hard wood chips which are bonded together. The edges of the handle and limb pockets are rounded to allow for a more comfortable experience. In addition the bow isn’t only sleek but lightweight to also ensure easier handling. You have the option to purchase the limbs separately so as to increase or decrease weight depending on preference. These limbs are readily available online. Though it’s built well, the bow is slightly heavy. Also the arrow guide isn’t as steady. However it’s easily replaceable. Unfortunately it doesn’t come with instructions to set up, though it’s not a complicated process. This bow gives you the option of buying for a right- or left-hand shooter in a variety of colors. The handle is made of hardwood while the limb is constructed using strong fiberglass. The outside features maple laminations for an attractive finish. This option is a little longer than the one we just looked at. The SinoArt Takedown Recurve Bow comes in at 68 inches, making it a bit heavier and longer than the other model we just reviewed. The riser here is made out of real wood, something we really like. It adds some beauty to the mix, looks nice, and the wood is very durable. It has also been specially molded and sanded to create a comfortable handle, so you can shoot all day long. 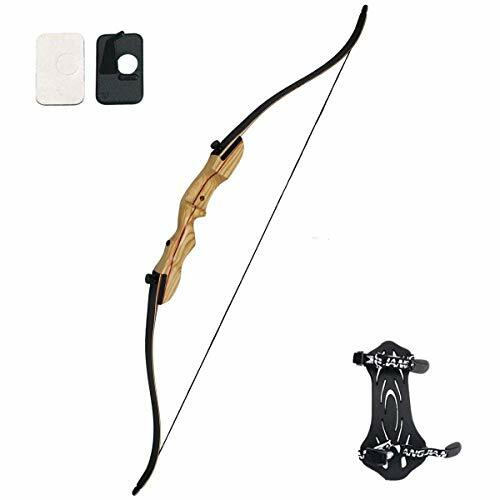 What is neat here is that the SinoArt Takedown Recurve Bow can be used by left- and right-handed shooters, as it comes with shooting kits for both. 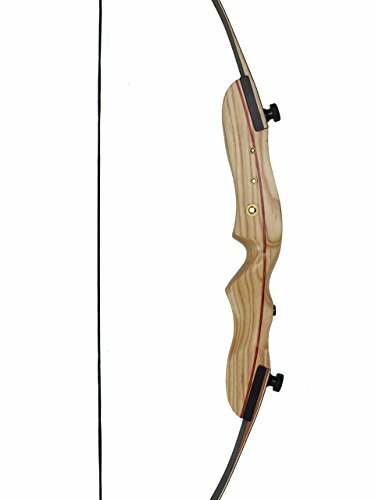 Keep in mind that this is a training and target practice recurve bow, one with a maximum draw weight of 36 pounds. This makes it OK for training, but it is definitely not a hunting bow. 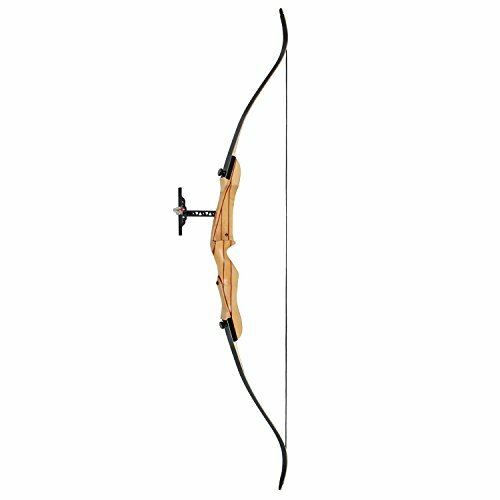 The limbs are made of hard and specially treated fiberglass to ensure a long-lasting bow. Here you also get an arrow rest, a bow sight, a finger tab, a bow stringer, and an arm guard. Like the Falcon Hunting Bow, the edges of the handle and limbs have been rounded for a sleeker look. In addition its light weight for a pleasant archery experience. On unboxing you’ll see a riser, bow string, bow stringer, arm guard, finger tab and arrow rest—all at a reasonable price. 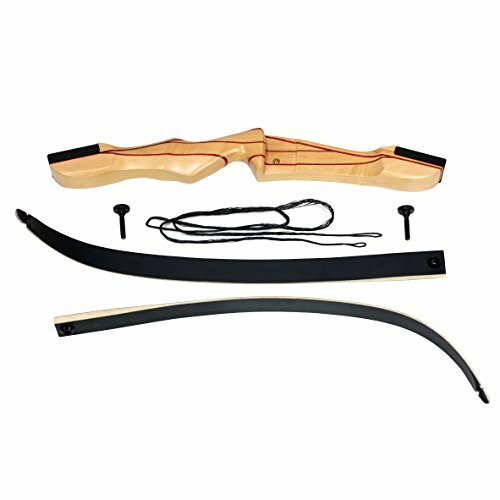 The bow is well constructed with no twisted limbs and functions as expected. The downside however is the arrow rest is cheaply made which might negatively impact durability. Setting it up might take you a while. It doesn’t help that the instructions aren’t in English—rather Chinese. You may take some time to figure out how to operate it. But once you do using it will be an easy and enjoyable experience. This particular bow is ideally for right-handed users and it’s perfectly suited for the novice archer. It’s constructed using high-quality materials. It has a metal riser and the limb is made of durable fiberglass with maple laminations. Whereas the first bow on the list was a 60-inch model, and the second one was a 68-inch model, this particular one comes in at 66 inches. Keep in mind that this is a right-hand only recurve bow, or in other words, left-handed shooters should look for another model. Although this recurve bow is quite long and large, it is really not that heavy at all. The high-quality metal riser may be very tough and durable, but it still does not weigh very much. At the same time, the metal riser has been rounded for a sleek and comfortable design, and a nice shooting experience too. The limbs are made of very durable fiberglass, although they are not the strongest in the world. 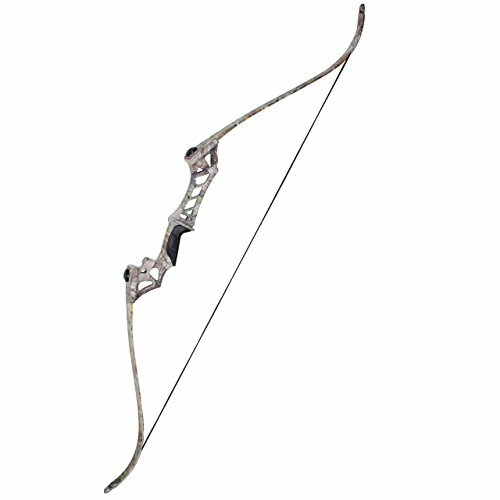 This is a training bow and competition bow, as it has draw weights between 20 and 36 pounds, making it decently strong, but still not strong enough for hunting big game, or even for little game really. The string is also decently constructed. However you might need to twist it about 15 times before stringing up your bow. This will ensure increased consistency. The edges are rounded for a comfortable shooting experience which is extremely important for shooting. The metal riser is lightweight for easier handling. You don’t need any tools whatsoever to assemble this unit which is convenient. However it doesn’t come with a manual guide with installation instructions. It comes with different arrow rest types: screw in, standard and flat to bow. Personally we recommend the screw in as it’s easier to attach. Unfortunately it doesn’t come with the locking nut for the arrow rest. This bow was designed with the beginner archer in mind. It’s ideal for right-handed shooters. Like the above bows, the limbs are also made of maple lamination and strong fiberglass. So far on this list today, this is by far the smallest and lightest bow. To be clear, this one is made for children and youths who don’t have that much muscle yet, are not that tall, and are just getting into archery. This bow is very lightweight, extremely so, making it perfect for youths and children. It comes in at only 48 inches, another factor which makes it ideal for kids. The riser is made of high-quality wood and has been specially designed for a comfortable hand feel. Keep in mind that this is a right-handed bow, not a left-handed model. We like that it comes with sight and arrow rest mounting holes. With that being said, this bow has a maximum draw weight of 22 pounds, which is decidedly weak. Yes, it is ideal for kids who are just learning to use their shooting muscles, but do not expect to go game hunting with this this model. The sight and arrow rest feature mounting holes for easier installation. It can handle draw weights of 12, 16, 20 and 22 lbs. and is 54” long. 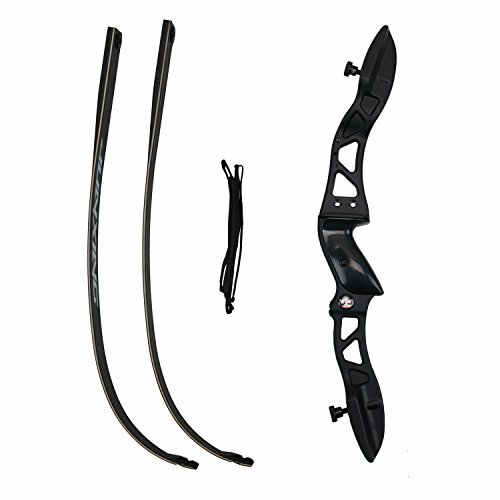 This package includes a youth bow, youth arm guard and an arrow rest. 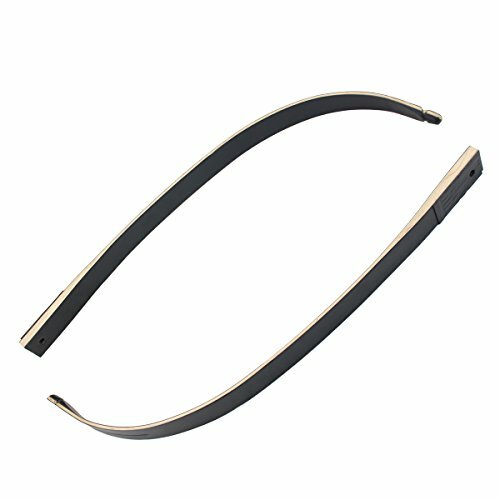 The bow is made of high-quality material which is also durable. The only problem is there’re no markings to indicate which limb is lower. Note that it may be too tall for a smaller child but overall it works well. This bow is made for the right-handed users. It has a bridged riser which increases its stiffness. This means you’ll experience less vibrations during shooting. The riser is made of durable metal. You can also purchase the limbs separately if you wish to adjust the weight of the bow. This unit allows you to shoot accurately. It may produce a loud sound upon shooting but it’s nothing a string silencer can’t fix. The bow not only looks great but feels comfortable to the touch. It’s just the right size—not too heavy or light for easy handling. However the limb is quite long meaning setting it up and detaching it isn’t as simple. The package includes all the tools you need to set it up. However it doesn’t come with an instructions guide to aid in installation but for most people it’s nothing that can’t be figured out. It has a short draw length so it might not be ideal for taller individuals. After going through our recommendations which one impresses you more? 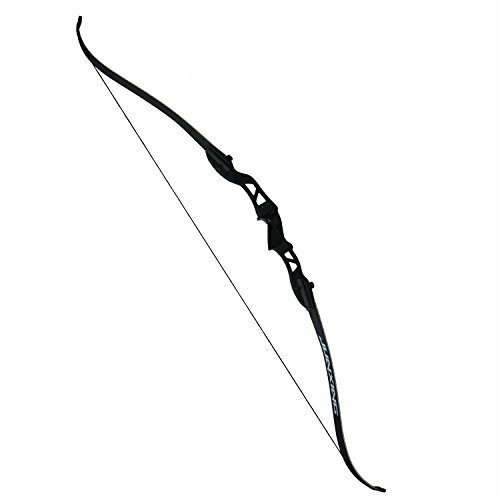 As for us the Takedown 68” Recurve bow is our top pick. It’s clear: They’re all built in a similar manner with more or less the same materials so the quality is the same. However the Takedown is different in that it caters to both right- and left-handed users. Also, it comes in a variety of colors. In addition it’s not only lightweight but affordable as well. A versatile product giving value for money is always the smartest pick, don’t you agree? Let's say you're already familiar with recurve bows, but you're looking for the best ones. Don't worry, we have a whole recurve bow buying guide to help you make the best choice!